If you're interested in teaching yoga to children, there are several different training programs that can help you become certified in this area of study. Most focus on what makes children's' minds and bodies unique and special, as well as how to reach and engage children during yoga sessions. Although kids' yoga positions are actually quite similar to those for adults, the teaching approach is different. There are many opportunities to become certified to teach yoga to kids. Rainbow Kids Yoga offers teacher training in many states, including California, Ohio, Colorado, Arizona and Texas. Rainbow Kids is for anyone who loves to teach children, and if you're interested, it's not a requirement that you be a yoga teacher. Certified yoga instructors receive continuing education credits for enrolling in these three-day training classes. The cost is $500, with a $250 deposit to reserve your space. Rainbow Kids will even work with applicants on payment plans and scholarships. Learn over 350 yoga poses for kids. YogaKids teacher training classes are held in many states, including Michigan, Vermont, Pennsylvania and Colorado. Check the website for a city near you and to review the training schedule. YogaKids offers both public trainings and workshops and is well known for its certification program, Foundations. The Foundations program begins with a four-day seminar with an intense focus on how to teach kids in the most beneficial way. Foundations is open to anyone interested in teaching yoga to kids and is a pre-requisite for the Advanced Training Practicum, which is stage two of certification. To obtain full kids' yoga certification, you'll need to attend stage three of the training program, Advanced Training Intensive, which is an eight-day program. The completion of all three stages makes you a certified YogaKids Facilitator, or CYKF. YogaKids is associated with Yoga Alliance, and tuition is $849 for each stage of training. There are also three-hour yoga for kids workshops for only $99. Next Generation Yoga training classes are located in Encinitas, California. Classes are focused on two age group ranges: Two through seven years and eight through 13 years. Next Generation Yoga focuses on joyful, playful, self-expression for kids through yoga. These classes are centered upon the interest, energy, and developmental stages of kids. This is a great forum to speak with other teachers and receive newsletters, online support, and yoga materials to help you get started. The cost for the three-day classes is $695 plus a $50 registration fee. Child Light Yoga is located in both New Hampshire and Maine, Child Light Yoga has a passion for children at its core. Teachers must have at least one year of asanas study, pranayama and basic yoga philosophy. Courses are focused from ages two through 13. To receive certification, yoga enthusiasts must complete a three-day training workshop, a take-home exam, and a three-day internship, although the initial three-day workshop is open to anyone. Visit the website for more pricing information. Creative Kids Yoga was created by Rosemary Todd Clough, a kids' yoga instructor of more than 30 years. The course uses a playful approach to teaching yoga that includes both music and dance. Training is offered at Moving Spirit in Merrimack, New Hampshire on a regular basis, as well as at the Kripalu Center for Yoga and Health in Stockbridge, Massachusetts. Teachers and parents are welcome to go to the introductory sessions, and certifications happens over three levels. Each of the first two levels are held over two three-day sessions two months apart. The third session is a week-long course that gets you a 200-hour certification. 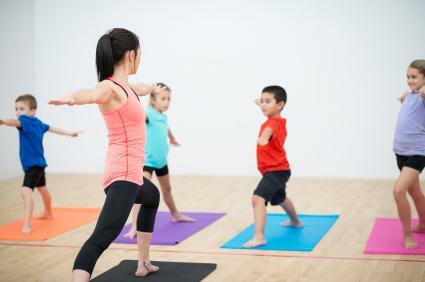 Mini Yogis kids' yoga training offers classes to teach kids ages three through 11 years, as well as advanced yoga teacher training to teach older children. Classes are taught around the country, including in California, Indiana, Arizona, Florida and Nevada and are given all year long. Each training course takes place over one weekend and is condensed into a 10-hour training session. The trainings focus on keeping yoga fun and interesting for the teachers and kids alike. Teaching children yoga is a fun and rewarding way of strengthening your own practice. Becoming a kids' yoga teacher is relatively fast and inexpensive when compared to other teacher trainings, and it can be just as rewarding. Whether you plan to expand your current teacher license or just want to focus on kids, becoming a kids' yoga instructor is a great place to begin.